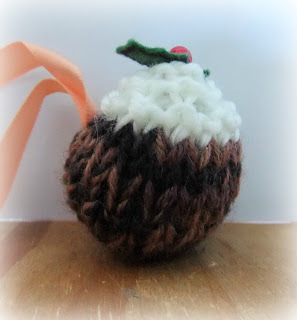 Last week in work, someone brought in a tiny knitted christmas pudding. It had been made to put a Ferrero Rocher sweetie in it (which was long gone), but I was all over the knitting like nobody's business! Within about 10 minutes I had worked out the pattern, and this became lunchtime knitting for me and two friends. So I thought I'd share the pattern. Cut the yarn leaving about 6 inches, and thread it onto a darning needle. Pass the darning needle through the stitches on the knitting needle, and then slide the knitting off the knitting needle. Sew up the seam. 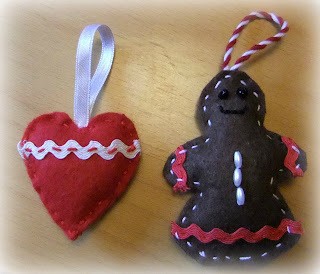 Cut out holly leaf shapes from the green felt, and sew on with a red bead for the berry. I used brown and black 4ply held double because it was the only brown yarn I had. Apologies for the rubbish photos, but it's just so difficult to get good photos in the winter light. I didn't put Ferrero Rocher sweeties in mine, because the sweeties wouldn't last five minutes in my house! After sewing up the seam I sewed the tail of yarn through the cast-on stitches so I could pull it tight to make a rounder shape. 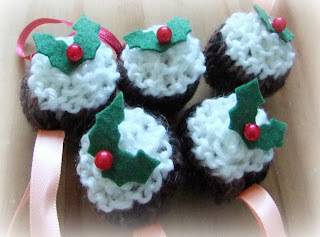 I stuffed them with some cotton wool, sewed a ribbon on the back, and hung them on my Christmas tree. 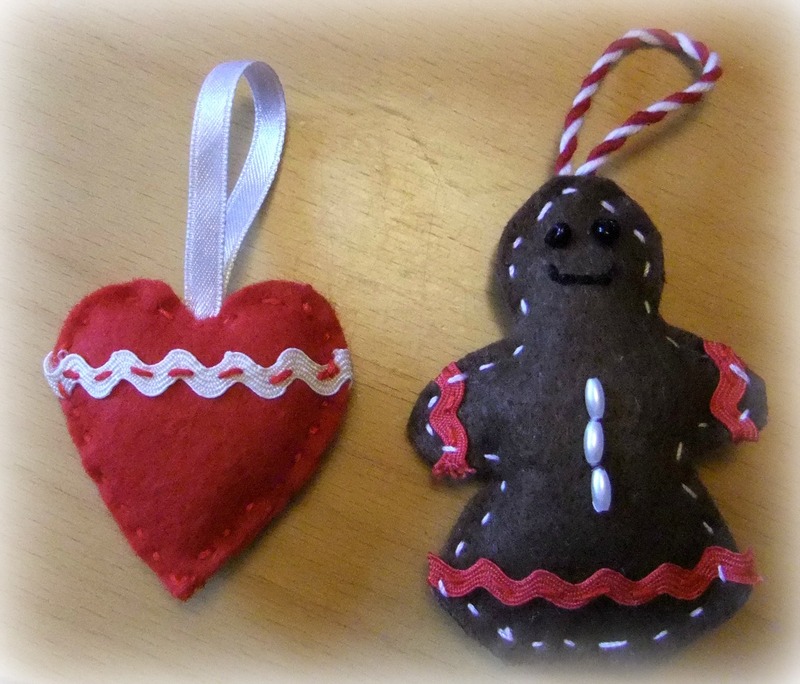 And below are some felt decorations my sister made. Aren't they great?! There was also a Gingerbread Man, but I didn't get a photo of him. I hope everybody has a lovely Christmas, and I am looking forward to seeing what crafty goodies everybody gets on their blogs! So very cute! On my list for Christmas 2013! Very sweet! What a fun idea.